Alongside the political and social upheavals that Egypt has seen from January and February 2011 to date, my work life as a scholar of modern Egypt has seen very significant change. In contrast to five years ago, I now spend at least one or two hours each day keeping abreast of the voluminous news in Arabic and English that emerges from the country, from the now significantly expanded number of media outlets there. I have had to overhaul existing courses and create new ones to offer my students historical perspective on the remarkable changes that the Middle East has witnessed. 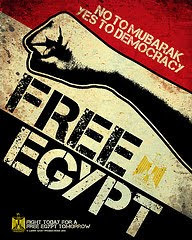 Perhaps above all, I have tried to contribute to public understanding and debate, both in my local community and abroad, about these remarkable changes by granting interviews to various media organizations and writing op-ed pieces and essays with my critical evaluation of recent developments in Egyptian political, social, and cultural life. I have welcomed and, indeed, actively sought out these opportunities for engagement with the public, as a means by which to put my longstanding experience with Egyptian affairs into action in useful ways. Without question, there is a particular satisfaction associated with taking ideas usually relegated to a classroom or library and applying them to live situations on the ground, as a means by which to foster better informed debates about Egypt and the Middle East. Before the Arab uprisings, these opportunities were usually few and far between, and limited in subject matter to the Arab-Israeli conflict. Four years on from the uprisings, these opportunities remain vastly enlarged given the still keen interest in the contexts of the uprisings. Without question, conceptions about the academic’s role relative to the public run the gamut from outright rejection of engagement, to polite lip service, to warm embrace of engagement as a scholar’s responsibility. My purpose here is not to quibble with colleagues about which view is appropriate. Certainly a great number of my peers have good reasons for skepticism about public engagement, not least those who have had profoundly negative experiences in dealing with the news media, having had their words intentionally or unintentionally misconstrued or taken out of context. Arguably, Middle East scholars face particular risks in having their words actively distorted and misrepresented, given the number of well funded partisan lobbies devoted to advocacy on issues related to our field of study. However, what I find curious and want to highlight here is the apparent ambivalence of academic institutions to the issue of faculty engagement with the public. I doubt I have come across a college or university that fails to include forms of public engagement among their central objectives. Yet, strikingly, in a recent unsystematic poll of peers and colleagues at a range of institutions, I found that public engagement was routinely ignored as a factor in how faculty are evaluated for merit increases in pay. Indeed, a great number of colleagues indicated that media interviews and op-ed pieces, while encouraged, are not formally considered at all when their performance is evaluated. I had distinctly personal experience with this phenomenon in my most recent evaluation for a merit increase in pay. Despite having written dozens of op-ed pieces and essays on Egypt and Middle East affairs over the past several years, garnering far wider audiences than all of my peer-reviewed academic publications combined, my performance was reckoned by the chair of my department as good rather than exceptional, largely because I am between book projects. The op-ed pieces and essays were regarded as part of the 20 percent of my performance associated with service – and only a part thereof, because that service category includes service to the university, service to the profession, and service to the community. The evaluation struck me as profoundly ironic in light of my institution’s most recent effort to brand itself as a university engaged with the world. Indeed, at just the time that the university is struggling mightily in the media to demonstrate the level of such engagement, from an institutional perspective the university is effectively discouraging this engagement through its structures for evaluating faculty merit. And as my informal poll suggests, my institution is scarcely alone in this apparently ambivalent attitude to academic engagement with the public. The lack of such engagement is an issue that is often politicized in this age of perennially shrinking university budgets. In light of my own experience, I cannot help but think that universities would be better served in this political struggle by rethinking their methods for evaluating faculty merit than by hiring marketing firms to mount elaborate branding exercises. Indeed, if faculty are willing and able to engage with the public, why not encourage them to do so rather than penalize them for having taken the time? A little reworking of criteria could go a long way towards creating a culture of academic engagement with the public.